As sinful as it is, there is no love greater than the love for chocolate. And those who appreciate chocolate for what it is, are always on the lookout for the finest varieties of it. 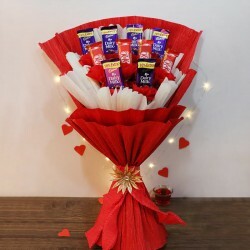 We're glad you are here, because we at MyFlowerTree share the same passion for chocolates, and our tastefully assorted chocolate bouquets are proof of that. The popularity of chocolates is something that's self-explanatory. Available throughout the world in shops small to big, chocolates are consumed in various forms. Everyone has his/her own preference of chocolates and the world is packed with sweet-toothed people. 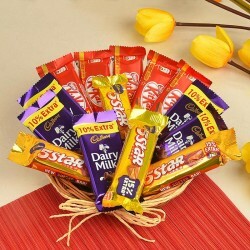 Chocolates are one of the most marketed products and is continuously bought and sold for self-consumption or gifting needs. 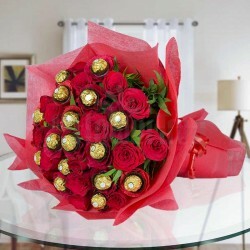 Talking of gifting, chocolates hold a status of their own when it comes to gifts. Being a world favorite sweet, chocolates make the most versatile gifts as everyone, no matter what age, loves them. 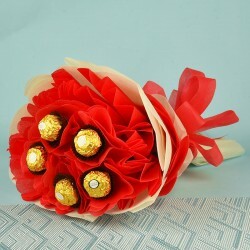 Coming in rich flavors, chocolates exude class and affluence. 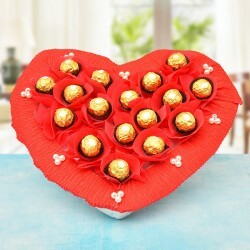 Often new products related to or made out of chocolates are launched by the gifting industry owing to their popularity. One such product that is highly adored among the masses mostly the youth, these days is a bouquet of chocolate. 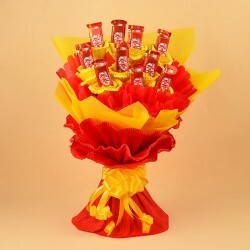 Combining the charm of bouquets and the opulence of chocolates together, this new gifting item has become a rising trend. It would make an apt gift any day for a chocolate lover. 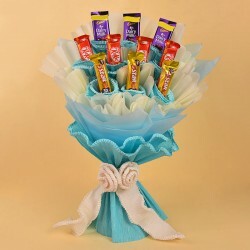 The availability of chocolate bouquet online has only boosted the popularity further. The consumption of chocolates is way older than an average consumer can anticipate. The earliest evidences of the usage of chocolate dates back to somewhere around 1900 B.C.E. Chocolate is believed to have been a part of cultures like Mayan, Aztec and Olmec, the last being even older than the other two. Chocolate is prepared out of the seeds of Theobroma cacao which means 'food of Gods'. These plants have been cultivated in Mesoamerica for almost three millennia. Mayan hieroglyphics suggest the preparation and consumption of chocolate drinks as early as 400 A.D. Later on, cacao was adopted into the Aztec culture as the people took over a large portion of Mesoamerica. As per a popular Aztec legend, chocolate was introduced to the humans by Quetzalcoatl, a deity depicted as a feathered serpent. Failing to grow cacao plants themselves due to unfavorable conditions, the Aztecs considered its seeds to be a luxury. Not only were the seeds imported to their kingdom, but were also used as currency and for paying off taxes. The cacao trees were considered sacred by all the above mentioned cultures and were often linked to royal blood lines too. It was only during 16th century that chocolate began being known to other cultures. The cacao seeds are believed to be one of the goods for trade, with Christopher Columbus when he set on his fourth voyage to Americas. Soon after the conquest of Aztecs by the Spanish, chocolate reached the European court. It was there that several additives, for instance sugar and vanilla, were included in it thus making it rich and flavorful. Still a rarity in those times, chocolate was deemed a royal commodity, consumed only by the royalties. Besides being a delicacy, chocolate is loaded with health benefits. Some of these major chocolate benefits are related to moods, cognitive function and cardiovascular health. Chocolate contains cacao butter which is rich in phytochemicals such as polyphenols (majorly flavanols) and methylxanthines. 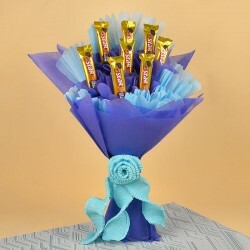 Properties such as the above, also contribute to the ever-growing popularity of chocolates and online chocolate bouquets. 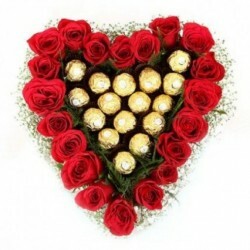 MyFlowerTree is a popular dealer in chocolate bouquets online, including the well-liked Ferrero Rocher chocolate bouquets. 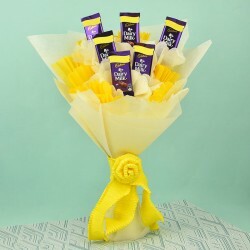 You can choose from among a wide range of products and purchase the choicest chocolate bouquet for birthday, anniversary, promotions, and baby shower and so on. Functioning as a one stop shop for flowers, gifts, cakes, cards and to order sweets online, we help you add the right bling and excitement to your events. 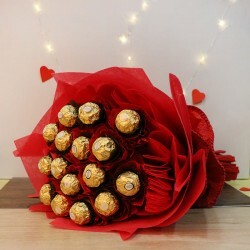 Get your darling a Ferrero Rocher bouquet to charm her with style. Working in 408 cities in India, we are known among our patrons for same day delivery services. 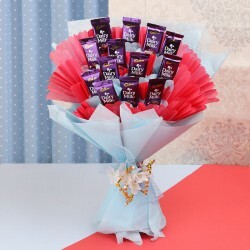 When you buy a chocolate bouquet, you buy a bundle-load of happiness. What more can a simple soul ask for? !